Nonetheless, Netanyahu called the ICC decision “very important” in comments released by his office on Sunday. 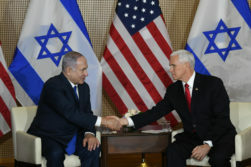 “This blocked a move that would have upended the original goal of establishing the international court,” said Netanyahu, who said the court emerged after crimes such as genocide intending “to deal with countries and regions that have no true legal system.” Israel and the US, he noted, are not in that category. Pompeo, like Netanyahu, made it clear that the US has their own judicial methods for addressing war crimes that may be committed by their citizens. “This would have been a very political effort to try and take on the people who were acting on behalf of the United States in ways that were completely consistent with our laws and try and hold them accountable in ways that were completely inappropriate,” said Pompeo of the ICC case. “I am very pleased that the ICC made this decision today. It’s the right one. Netanyahu viewed the decision as having significant ramifications. “This corrects an injustice and will have far-reaching implications for the functioning of the international system regarding the State of Israel. I commend the US, President Trump and the Trump administration for their strong stand alongside the citizens of Israel and the soldiers of the IDF. However, the ICC did not indicate the final decision was made due to the inability to try the case. Afghanistan is a party to the ICC, although the official ICC decision posted to the ICC website did note that any alleged crimes committed by Americans outside the territory of Afghanistan would not be admissible. Alleged crimes inside Afghanistan, however, would be. Ultimately, the ICC elected not to move forward with the case due circumstances such as the significant passage of time since a number of the incidents had occurred—dating back to the mid-2000s—and the lack of cooperation from relevant parties thus far in the preliminary investigation.